Do you know what your perfect ring is, but can’t find it for the perfect price? We may just have a solution called Moissanite! Here are a few things we have learnt about this beautiful gem! Moissanite is a gem stone all on its own accord! First discovered in 1893 a meteor crater in the Arizona, USA. All these years on though, it is now completely lab grown. It is not trying to pass off as a diamond, although they do look very similar! As you may know, Diamonds are graded on a colour scale. Moissainte is not graded to the same scale. However, Forever One moissanite is compared to a GIA-certified E-color diamond. In other words, if you are looking for a “colourless” look, Moissanite is for you! 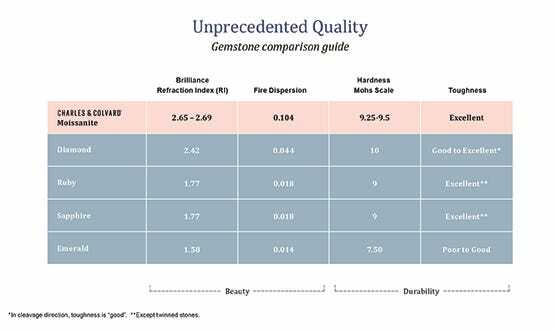 On the Mohs Scale of Hardness, a diamond will rank a score of 10 and Moissanite comes in at a close 9.25. Which means there’s no need to stress about this gem only lasting a few years or scratching up easily, these bad boys are made to last! There is a lot that happens in the world of diamonds these days that most people don’t class as “ethical”. Of course, there are more and more “ethically sourced” diamonds that are popping up around the place. But, if you want to steer clear of the industry Moissanite is for you! As we mentioned above, practically all Moissanite is now lab grown, which means that you don’t have to compromise your ethical values for a beautiful ring! The price tag says it all! Most companies will still talk “carats” for Moissanite to keep it simple! So if you’re after a beautiful 2 carat solitaire engagement ring but can’t justify the $19k for a diamond ring, Moissanite to the rescue! You can get a 2 carat solitaire moissanite ring for approximately $1.5k! Did someone say an extra $17.5k for the honeymoon?! Hello worldwide trip! If you’re not looking for diamonds there are so many beautiful options out there from Sapphires to Ruby’s and so much more! If you are looking for your perfect diamond there’s so many amazing Australian stores out there ready for you to find your perfect ring! Looking for your perfect venue?! We’d love to tell you more about Northshore Harbour!